Fema Max Plus DHEA is an all natural, herbal supplement indicated for the relief of some of the many discomforts that are commonly associated with menopausal discomfort. Fema Max Plus DHEA uses ingredients such as Mexican Wild Yam, Soy, Vitamin B6 and more to relieve: Hot Flashes, Moodiness, Fatigue and Insomnia. Mexican Wild Yam- Mexican Wild Yam has been proven ineffective in helping with menopausal symptoms. Vitamin B6- Vitamin B6 has been shown to help in the treatment of PMS symptoms such as breast pain and depression. Soy- Hot flashes caused by menopause can be reduced with the help of Soy. Black Cohosh– Some menopausal symptoms can be reduced with Black Cohosh. Kudzu– Kudzu has insufficient evidence showing that it can help relieve the symptoms of menopause. The recommended dosage for Fema Max Plus DHEA is 2 capsules daily. The price of one bottle of Fema Max Plus DHEA would normally be $21.49, however, they have now lowered that price. 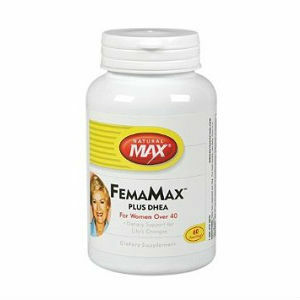 Now one bottle of Fema Max Plus DHEA containing 60 capsules costs $12.27. This means that you save 42%. Fema Max Plus DHEA comes with a 5 star guarantee. What does this guarantee you? Nothing. All it says is that they will have low prices and and that their site is secured. This guarantee offers you nothing money wise. Meaning that if you buy Fema Max Plus DHEA, you are stuck with it. No money back. Fema Max Plus DHEA does not use all clinically proven ingredients, in fact, only Black Cohosh has been shown to be effective for the relief of symptoms often associated with menopause. Jackie Horowitz	reviewed Fema Max Plus DHEA	on April 27th	 and gave it a rating of 2.